Jericho stretches out east of the tel of ancient Jericho, which dates back to 10,000 years, and is most famous for the fall of it walls, caused by the holy ram’s horn trumpets blown by Joshua’s priests. 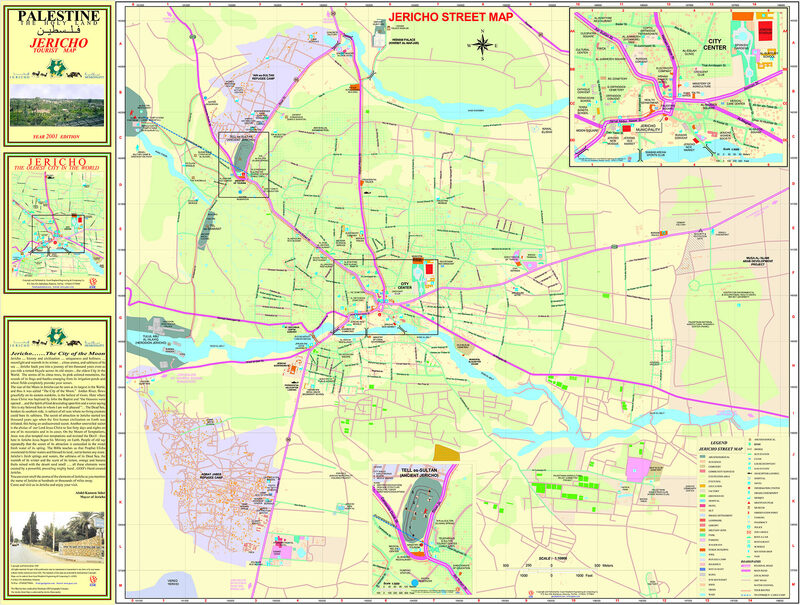 Jericho was the first city to be conquered by the Hebrews after the Exodus. It was razed to the ground and cursed, then rebuilt by Ahabin the 9th century BC. It was later fortified by the Maccabees. Jesus passed through Jericho several times. The origin of the name “Jericho” is Semitic. To the Canaanites it meant “The Moon”. In Syriac the name meant “Scent and odour”. The city is also called “The city of Palm” and “The Garden of God”. [tg_accordion title=”History” icon=” fa-arrow-circle-down” close=”1″]Jericho is a green oasis in the Jordan Valley which lies 7 km west of the River Jordan, 10 Km north of the Dead Sea and 30 Km east of Jerusalem. It lies 250 meters below sea level and thus it is considered to be the lowest city in the world. The origin of the name “Jericho” is Semitic. To the Canaanites it meant “The Moon”. In Syriac the name meant “Scent and odour”. The city is called “The city of Palm” and “The Garden of God”. Jericho is the oldest city in the world. The ruins of the oldest civilization discovered in Jericho are 10,000 years old. 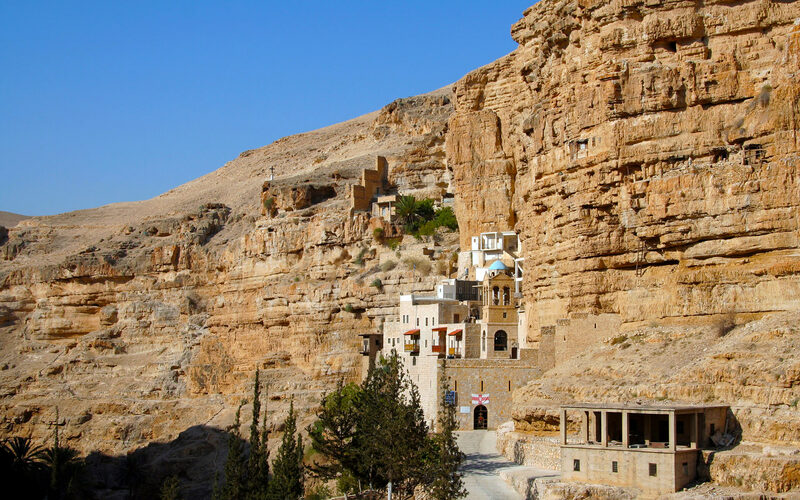 There are a lot of important and beautiful historical places to visit in Jericho, such as Old Jericho, River Jordan where Jesus Christ was baptized, Mount of Temptation, Hisham Palace, Ein Al-Sultan (Elisha) spring, Sycamore tree, Monastery of Saint George (Wadi Kelt), Hasmoneans (Herod) Palace,Monastery of Dier hajlah, Kumran Caves, Dead Sea, and a lot more. The nice climate of the city is conducive to tourism both domestic and International. The average temperature in January is 8.5 degrees and the lowest average annual temperature is 17 degrees. The average annual temperature is 23.5 degrees and the highest average annual temperature is 30.5 degrees. The average annual amount of rainfall is 150 millimeters, and the average annual humidity is 52%. The amount of rainfall in the Jericho area is less than that of the surrounding mountains and the coastal regions, thus Jericho area relies entirely for drinking and irrigation on subterranean wells and springs such as the Ein Al-Sultan spring. The source of this water is situated in the distant mountains. Ein Al-Sultan spring in considered to be the main source for agriculture. It has an output of 680 cubic meters an hour, and a salinity of 600 fractions in one million. It provides a steady output throughout the year. It is used equally for drinking water and for irrigating. 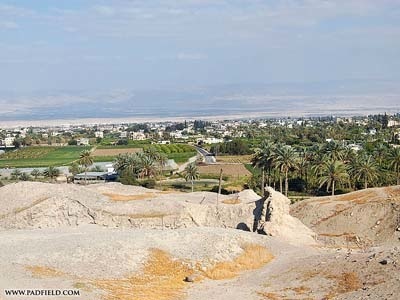 In addition to its tourist sites, Jericho is considered to be an important area for agriculture. It is famous for its citrus fruits, dates, bananas, flowers and winter vegetables. I shall have to increase that suspicion which has beset the slave of Banu Numair. The devils of the land fear my roar, and the serpent of Aryaha’ has responded to me. Yaqut also refers to it in the form “Ariha’. in the measure “af’al”. He quotes Al-Hutahle’s saying: I searched for it (my sword) among the swords of Jericho, and when it returned to my hand I found no parallel to it. Al-Bakri says. “It is ‘Ariha’, or perhaps ‘Ariha’, when attributing (a noun ) to it they just say ‘Aryahiyy’, It was called, “Anthony’s present to Cleopatra, when Egypt fell under the rule of Anthony, Cleopatra, the beautiful Queen of Egypt met him. He was so bewitched by her beauty that he deserted his wife, sister of Octavious ( Augustus ). Cleopatra deprived her lover of his will-power for nine whole months. He became infatuated with her and offered her a large section of Syria. The Palestinian shores, together with Jericho and its groves abundant with balm, as well as the Dead Sea, were among what he offered Cleopatra. The city of Jericho was called “Wadi As-Saisaban, Valley of Sesban”. It was given this name because of the abundance of a certain plant that grows there. It densely entwines round its groves like a fence, and is still found there. [tg_accordion title=”Jericho in History until the time of the Arabs” icon=” fa-arrow-circle-down” close=”1″] Jericho is one of the most ancient human habitations. The most ancient human remains were found in it, some of which go back to 5000 years B.C. Others believe that these remains go back to 7000 years B.C. The most recent opinion on this subject is that they date back to 8000 years B.C. The site of ancient Jericho is half a kilometre away from modern Jericho at a depth of 820 feet ( 250 metres) below sea level. It lies at latitude 31 52 degrees north and longitude 35 39 degrees east. The evidence indicating that it is one of the most ancient cities in the world is borne up by a series of excavations made at ” Tall as-Sultan “, which is oval in shape, formed by the successive accumulation of ruins with the passing of time. Excavations have been continuing successively since the middle of the nineteenth century up till now. The German-Austrian Mission in which the two archeologists E. Sellin and C. Watzinger worked, was the first one to be interested in uncovering the antiguities of Jericho, and that was in 1911. They were succeeded by the English, who conducted excavations at Tall as-Sultan under the supervision of first J. Garstang ( 1930-1936 ) and completed by Miss K. Kenyon ( 1952-1961 ). She published a resume of her work in two huge volumes ( 1960-1965 ). She is considered to be the greatest authority on this subject. She is the one to have estimated the age of the city to be 8000 years B.C. Its habitation certainly started about that time which undoubtedly makes it the most ancient known city in the world. [tg_accordion title=”The pre-Stone Age or the first Neolithic Age in Jericho 6800 B.C” icon=” fa-arrow-circle-down” close=”1″] Miss Kenyon’s excavations have revealed that the ancient city was inhabited during four successive intervals during this age. The first was the first Neolithic Time. In this it was inhabited by a folk called ” An-Natifiyyun “, who depended for their food on collecting wild seeds. It is probable that they did not plant seeds in reality, but owned scythes with flint edges, straight bone handles to harvest wild seeds, and stone mortars with handles for grinding them. Some of these groups lived in caves, while other groups occupied primitive villages excelling in the art of architecture. So they started to build round huts from sun-dried bricks flat at the bottom curving at the higher edge. They used to bury their dead with their personal jewellery in graves hewn out of rock. [tg_accordion title=”The pre-Clay Age or the Second Neolithic Age in Jericho, 5500 B.C.” icon=” fa-arrow-circle-down” close=”1″]The building of houses in this interval showed a great progress. Their rooms were about 6.5 metres by 5 metres or 3 by 7 metres. They were usually of a rectangular shape built in an open yard, seven metres long and seven metres wide and used for cooking. The thickness of their wall was half a metre. They used stones to build the foundation, and the rest of the building was built of sun-dried bricks. Its shape was similar to the iron used for cauterising animals. So the brick was rectangular in shape with sharpened edges. The floor formed was of a mud layer topped by a layer of lime, followed by soft lime dyed red or light blue. Then it was polished to acquire a new lustre. People in this age lived in pits. They worked in agriculture and in domesticating animals. They introduced the manufacture of pottery to their homes, but it was a primitive and rough one painted in red in geometrical figures. People in this age were a great deal more advanced than their predecessors, as they lived in huts built of clay and manufactured earthenware in inclined lines. [tg_accordion title=”Jericho in the Post Neolithic Age:The Bronze Age:” icon=” fa-arrow-circle-down” close=”1″]At the end of the Neolithic Age which was about the year 4000 B.C., a vacancy occurred in man’s residence in Jericho and it became uninhabited for a certain period of time. There are two different evidences to support this: the existence of an accumulated layer of disintegrated organic matter over the Hill, part of which is recognizable, and the absence of any remains from the age known as the Chalcolithic Age which followed the Neolithic Age, and in which metals were used for the first time. The date of man’s habitation on the Tall ( Hill ) can be traced back to about 3200 B.C. The best illustration of this can be found in tombs. The main cemeteries of old Jericho are found on the site on which the ‘Aqapat Jabr refugee camp stands from the northern part. Some graves were dug up in the streets and courtyards of the camp. The most interesting of these graves is one which goes back to that age, as it was found as a result of an examination by carbon number 14, that its history goes back to 3260 B.C. ± 110 years. That grave contained 113 skulls arranged round the tomb’s chamber. The center of the chamber contained a heap of burnt bones. Some of the skulls carried the traces of scorching a heap of burnt bones. Some of the skulls carried the traces of scorching but were not deliberately burnt. This indicates the existence of certain strange customs in connection with burial rites. we also conclude that the bodies of the dead were first placed in the open until the flesh was decomposed and separated from the bones. The collecting of these numerous bone skeletons followed, with the skulls being symmetrically arranged in a row round the tomb’s chamber with their faces directed towards the inside. The bones were heaped in the middle with the necessary inflammable material. Then it was set on fire. When the heap cooled down after burning, the funeral offerings made mostly of earthenware, were placed in the grave, while the burnt bones were covered by a layer of stone chips. In reality, the other archeological discoveries in Palestine and Trans-Jordan did not produce any evidence corroborating the existence on these customs, though the custom of exposing bodies in the open, until the flesh disintegrated was not a custom remote from what was familiar. We have nothing about those people except that they were the pioneers of the following age, that is the First Bronze Age, which was the most prosperous one in Jordan and Palestine. We see the features of the First Bronze Age, which extends from 2900 B.C, evidently clear in Jericho especially with regard to defensive fortifications in the town. These fortifications were, no doubt, supremely important. The defensive walls were repaired and rebuilt sixteen times during the First Bronze Age which lasted 600 years. It is often difficult to indicate the various periods when the renewal of the building of the walls was made, as they used to fall down as a result of earthquakes, or because of infiltration of water into their foundations, and the people were prompt to repair them. Some destruction befell the walls as a result of enemy attacks. In any case there appear on these walls during that period the traces of destruction and ruin, but traces of repairs and renewed building are also apparent on then. This goes to show that the inhabitants of the town lived a life devoid of security and stability. Nevertheless, the general picture shows a continuous improvement in the fields of civilization and construction as people started to use copper in large quantities in order to manufacture weapons and tools. Pottery utensils show an abundance of trade exchange with all neighbouring valleys. This period revealed a great progress in civilization, as it was accompanied by the appearance of new towns in numerous sites that had been hitherto uninhabited. But this civilization, along with other civilizations preceding it, crumbled and came to an end at the hands of Bedouin raiders. It seems that the people at the end of First Bronze Age started to enjoy a greater stability and tranquility leading to the neglect of these defensive fortifications. Successive Peoples who came to Jericho after 2300 B.C. [tg_accordion title=”Introduction ” icon=” fa-arrow-circle-down” close=”1″]After this date new inhabitants settled in Jericho. They resided first on the top of the Hill. They built for themselves some ramshackle homes. The spread of these homes stretched on the Hill slopes, as there was no defensive wall in that interval. There is an edifice on the western side which may have been originally a temple, as what resembles an altar was discovered together with the remains of a small animal under its foundations. This period is known as marking the beginning of the Middle Bronze Age. In reality the tombs of those people attracted most attention, contrary to the collective cemeteries where the dead used to be buried in previous ages. They buried one dead person in every grave only placing with him some chattels and jewellery. Graves stretching 248 metres from the original three hundred and sixty metres were discovered at Tall A-Sultan. Some of these graves were very wide with the pit’s width being three metres and its depth five metres. The dimensions of the mausoleum chamber were 360, 330 and a height of 260 cms, which necessitated digging out 150 tons of rocks, and all this was for the sake of burying one person. We can see that bodies were exposed until the bones were stripped off before they were buried, as the folks who came before them did. The objects placed inside the grave varied in accordance with the models of graves. In some of them there was nothing save a dagger, in others pins and beads ( presumably these belonged to women ). In some others some pottery utensils only were found, while in other tombs a number of jars, a dagger or a spear head. Nevertheless all these had one thing common namely the existence of a small niche hewn out of the wall of the mausoleum chamber. It contained a four-headed lamp, the type which was prevalent in that period. It appears that on the smooth surface of a rock of the corners of a grave that someone had drawn some small pictures in the form of a goat or an ibex or a tree, in addition to two men armed with spears and shields. This is, as we know, the only known illustration from these people. Then earthenware utensils are not distinguished for accuracy and mastery, having no adornment except for some circular lines which are colourless, and no paint of any sort, a proof that they were only made then for utilitarian use without any interest to decorate them. [tg_accordion title=”The Hyksos” icon=” fa-arrow-circle-down” close=”1″]Jericho was one of the strong-holds of the Hyksos or Shepherd Kings 1750-1580 B.C. as the Bible calls them. It is believed that they brought horses with them, and perhaps the chariot, to Palestine and Egypt. Their houses were well built and covered the whole top of the Hill. Before their arrival the town was surrounded by a strong baked bricks, wall. They introduced a brand new system of defensive fortifications, not to Jericho alone, but also to all parts of Palestine. This new defensive system consisted of a steep earth slope topped by a wall made of moulded baked bricks. [tg_accordion title=”The Canaanites ” icon=” fa-arrow-circle-down” close=”1″]These were among the folks that emigrated from Arabia to physical Syria, and Jericho was one of their most important cities ( 1400 B.C. ). The name ” Jericho ” to them meant ” the moon “. Their houses were built near the site of Al-‘Ain where the fortress gate stood. The area of the city was six acres in their time, and its walls reached a height of twenty one feet. Their type of architecture followed this model : every building consisted of one room having side doors and elevated platforms and was surrounded by asphalted black soil. Their walls were built on the Babylonian style. The grandeur of their buildings was evident from their monuments which included stone columns on both banks of the Jordan River, from the inside of the Temple of Jericho, and from the buildings erected round a courtyard in the middle of which there was a wide arched gate which led into it. This Canaanite style still prevails in the Palestinian rural areas as well as cities, and in the circular type of the architecture of the dome which appears in the villages of ‘Ain Malaha,’ Ainat, Jericho and Wadi An-Nutuf. It is one of the most prominent characteristics of Canaanite architecture. The Canaanites excelled in the sculpture of statues and in pictorial sculpture which appears in the layers of gypsum covering the skulls, and which are similar to a head cover. It is exactly similar to the contemporary head dress worn by Palestinian women. It is known by its popular name, “Al-Wiqahyah” ( The protector ), or ” As-Samada” or ” Al- ‘Usabh al-kan’aniyyah “( The Canaanite Turban ). Weaving looms, clothes, bedding, mats, tables, chairs, mineral pins for binding clothes and for adornment were found. Earthware manufacture was advanced with them. We find plates, jugs, large copper basins, large water-jars pots and clay ovens (bread ovens that resemble those of present villages ). Excavations disclosed numerous family mausoleums containing remains of bodies next to which were found the traces of food, cooked or grilled mutton in earthenware utensils, and the remains of cereals, pomegranates and raisins. It is clear that the religious belief has become now more evident and more refined than before as threefold statues were found in Jericho, which remind us of the trinity in Canaanite worship, namely the Fertility God, the Fertility Goddess, and the Enemy of the Fertility God. The statue of the Fertility Goddess was the statue of Goddess ‘ Anat known in the texts of Agarith where she seizes her breasts in order to give fertility and life to the land of the Canaanites. As far as the religious places are concerned there is a temple in Jericho containing a niche. The plan of its architecture was taken by the Jews in their synagogues. Then the Christians transferred it to their churches, later it appeared in Islamic mosques. Excavations at Salin revealed the remains of two Canaanite fortresses, one of which rose on one of the seven hills on which Jericho was built. [tg_accordion title=”The Israelite Invasion” icon=” fa-arrow-circle-down” close=”1″]At the beginning of the thirteenth century B.C. the Israelites invaded Palestine after their exodus from Egypt and several years in Sinai and in the region of the northern Arabian Peninsula. They started by attacking Trans jordan where they crossed the Jordan River Valley on foot coming from the hills of Moab on the ( East Bank ). They pitched a camp at Abel Shetem whence they moved on Palestine under the command of Joshua. Jericho was among the Palestinian cities which fell into their hands after making for them from their camps which they had erected from clay and palm branches, forty years after their exodus from Egypt. Priests bore the Arc of the Covenant and compassed the city with it, headed by the seven priests, the trumpet-bearers, walking and blowing the trumpets with those who were armed walking behind the Arc of the Covenant and blowing their trumpets, and so they did once daily for six days. On the seventh day the priests blew the trumpets, Joshua said to the people, ” Shout, for the lord hath given you the city. And the city shall be accursed, even it, and all that are therein, to the lord: only Rahab the harlot shall live, she and all that are with her in the house, because she hid the messengers that we sent Yoshah son of Nun Moses’ boy and Calob son of Yofnah – and it is said Kilab son of Yofnah, Moses’ nephew. [tg_accordion title=”Jericho after the Israelites” icon=” fa-arrow-circle-down” close=”1″]It appears that Jericho flourished in Ruman times as is shown in the remains of canals they dug and which can be seen at the River Kilt. In this period Jericho started to export dates. Jericho acquired a great importance in the time of Christ (may peace be upon him) as Jesus Christ Himself visited it and cured the eyes of two blind men, Bartimoeus and his friend. While He was in it He visited Zacchaeus the publican in his house. As Zacchaeus was of small statue he was forced to climb up a tree to see Jesus in the crowd. Jesus walked along the caravan rout between Jericho and Jerusalem, which was infested with thieves and highwaymen. In the reign of constantine the Great (306-337 A.D.), the founder of constantinople, Christianity was spread in Jericho by monks and hermits who lived in convents and churches which they constructed to become a centre for the propagation of Christianity. In 325 A.D. it became the centre of a bishopric. The Roman Emperor Justinian (527-665 A.D.) constructed a church in it. It was in his reign that a road was built joining it with Petra. The caravans used to cross it in 3-4 days. Another road was built joining it with Bisan. It appears that churches and convents became more numerous than they were in the seventh century. Arco Levaux said that three was a church at Al-Juljal, and another at the place where it is thought that Jesus took off His garment before His baptism. Another church was built inside a large convent under the name of St. John. It lies on a height overlooking the Jordan River. Nevertheless this did not prevent the deterioration, neglect and ruin that began to befall Jericho and the churches and convents round it, following the diversion of the caravan route. The hermits’ caves on the Mount of Temptation overlooking the city, remained an indication of the lofty spirit of the early and medieval centuries. The amount of rainfall in the Jericho area is less than that of the surrounding mountains and the coastal regions, thus Jericho area relies entirely for drinking and irrigation on subterranean wells and springs originating in the distant mountains. The area within the municipality limits is about 45 square kilometers, and the population of the city of Jericho alone is 17,000. If we include the population of the surrounding villages and refugee camps the number goes up to 25,000 inhabitants. Even More reading? Goto the Jericho website .